The worst thing a concept car can be is boring. In that sense, Mitsubishi's 1991 concept car, the mS 1000, is an absolute success. To most people, I suspect it comes off as ridiculous, and that's hard to argue. Still, I think there's a valuable lesson in this car that's valid today: Not every car has to be serious. I stumbled upon this car looking for something else, but once I saw it I couldn't get it out of my head. I mean, look at it. It feels like something out of a Dr.Seuss book or a cartoon. It has design cues from a number of classic sources, especially vintage Jag sedans, but the proportions are completely exagerrated, in ways that we hardly see today. Car proportions get modified by fashion and aerodynamics all the time, and currently we're in a short greenhouse-high beltline era. 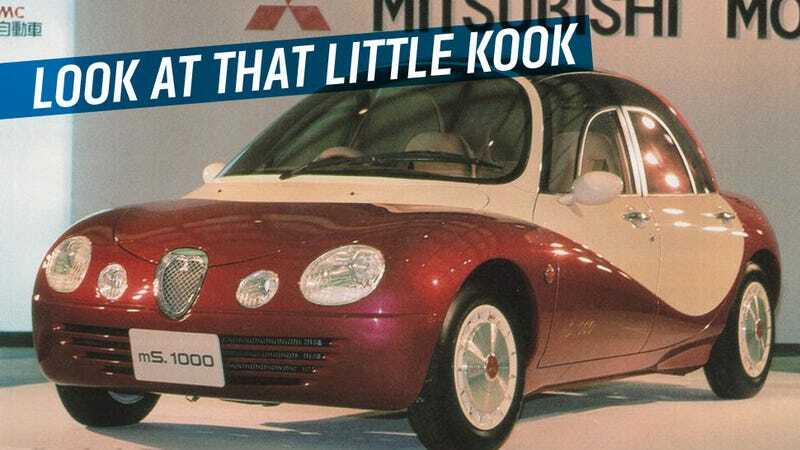 The mS 1000 is the opposite, with a tall, roundy greenhouse that brings to mind the big forehead of a baby, but with a number of interesting details, like a window-in-window design and a partially glassed roof that suggests an old T-top. It's sort of retro, but not really. More just retro-inspired bonkers. It's clearly an 90s jellybean type design, but it pushes those curvy forms to their logical extremes, resulting in a friendly, fun overall shape as opposed to the bland suppositories many cars ended up like, the unfortunate result of attempting to make these curvy forms more aggressive. There's not a whole lot of information about the concept online — in English, at least. It used a little 997cc four making 82 HP — so we know it wasn't a Kei car. It's a 4-door sedan, and likely built on one of Mitsubishi's existing platforms. It looks like the cars were shown at the 29th Tokyo Motorshow, and the Mitsubishi press kits used phrases like "Human Scale Technology" and "Small is beautiful." There was a sporty variant as well — the rS 1000 — and they were supposed to be sort of his-and-her commuter cars. Oh, wait — I just now got the names! mS and mR — miss and mister! Oh, you crazy Mitsubishi meshugganas! This is better than when I figured out Arby's was for RB. Roast Beef. Mind=blown. It's just so freaking cute, in a crazy, exuberant way. That two tone paint, with its double-down on the curvy shapes, those big lights, the funny ovoid grille, the plucky bulldog stance. It's a ridiculous car, but I can't imagine not having a good time in it. If you're going to be driving a little 1L econobox around, why not have fun with it? I know this would be a hard sell in America, where even the cheapest entry-level cars seem to have to pretend to be BMW fighters, but at some point you've got to just accept what you have and have fun. So, everyone take a moment before the weekend, if you will, and look out a window. Look at the sea of indistinguishable white and silver sedans, and for a moment, just imagine those roads sprinkled with a few candy-colored little kookballs like this buzzing around. Not everything — we still need our lithe sports cars and brutal-looking trucks and beefy muscle cars — but I think the stigma of a truly, unashamedly silly car has to go. I'm pretty sure I'm secure enough to drive something like this. I think.